It is always wise to be a smart shopper, especially when you are shopping for something as important as a refrigerator. This appliance is like the lifeline of your kitchen. Without it, keeping foods fresh and safe would be next to impossible. Unless you only want to eat boxed and canned foods, you need a refrigerator that will keep food items cooled to the proper temperatures to assure they are not growing bacteria or otherwise spoiling. Because the refrigerator is a very important appliance, being a smart shopper and learning how to research your options becomes important. Not only will this help you to ensure that you have chosen the right refrigerator to meet your household's needs, but it also will help ensure you get the best deal and are not overspending. We want to help you be a good shopper by offering this review of the FFTR1814QW from Frigidaire. We will first take a look at the company, so you have some background and understand what to expect in terms of service and value. Sometimes brand names aren’t important, but when it comes to refrigerators, the brand can mean a great deal. We will also review the FFTR1814QW, giving you information on specifications, along with details on operation and the pros and cons that have come from reviews from real users. Finally, we provide you with a comparison between this model and two similar models. We want to ensure you get the benefits of comparison shopping without the hassle. Frigidaire is a well-known brand name in kitchen appliances, especially refrigerators. This is a U.S. company that originated in Indiana. It was originally called the Guardian Frigerator Company, but the name changed to Frigidaire in 1919. One of the founders of the powerful General Motors company, William C. Durant, invested in the company. In its early years, the company was mainly known for producing the best refrigerators. The name became synonymous with refrigerators and often is credited with being the reason why many people called them a fridge. In fact, the company was the first to create the self-contained refrigerator, room air conditioning, the 30-inch range and the home food freezer, so it was a leader in the field and helped us to get to where we are today with refrigeration technology. Frigidaire also claims it was the first to introduce the concept of color coordinating appliances in the kitchen. So, not only was it on the cutting edge of technology, but it also had a hand in style and design. The company was owned for 60 years by General Motors until it was sold to the White Sewing Machines Company. Then, it was sold to Electrolux, which has been the company's parent company since 1986. Today, Frigidaire stands up against strong competition from other brands that have also made a name in the industry. However, the company stands behind its original ideas by making it easier to feed your family by using its products. Products are designed with you in mind, and new innovations are released in the hopes they make your life easier and allow you to manage your kitchen better and prepare meals to keep your family healthy and happy. It also helps to know that when the door is opened to 90 degrees, the width required is 58 1/2 inches. In addition, with the handles, the door depth is 32 5/8 inches. The textured door style is UltraSoft, which features color-coordinated handles. The door is also reversible for entry on the left or right. Inside the refrigerator compartment, there is standard lighting to illuminate the two full-width sliding shelves and two clear crispers. There is also two humidity controls and a one-gallon storage bin in the door. There are three full-sized door racks and a clear dairy compartment. The freezer has one full-width shelf. It is not adjustable. The door features two full-width racks. It is important to note that this is a very basic refrigerator unit. It does not come standard with an ice maker, but for additional money, you can add that on. It is completely assembled in the United States as well. Because this is a basic unit, you won't have to spend too much to get the Frigidaire FFTR1814QW. The suggested retail price is a low $629. You can buy this unit almost anywhere that sells kitchen appliances. Retailers are available online or in physical retail stores. Keep in mind that if you do add the optional ice maker, then you will be charged an additional fee for that. It is also important that you remember this is a basic unit. This is one of the lowest priced refrigerators that you can buy. However, quality is still important. Lower-priced units may be lacking in quality when compared to the Frigidaire FFTR1814QW. You should carefully consider build quality when choosing a refrigerator and when looking at the price of the units you are considering. You may save money on a lower-priced unit, but in the end, you will probably pay with many headaches over repairs and issues that come up due to the poor quality. However, with that in mind, this price is fairly rock bottom for refrigerators, so you probably won't find many that cost less. Now, we want to help you with comparison shopping. 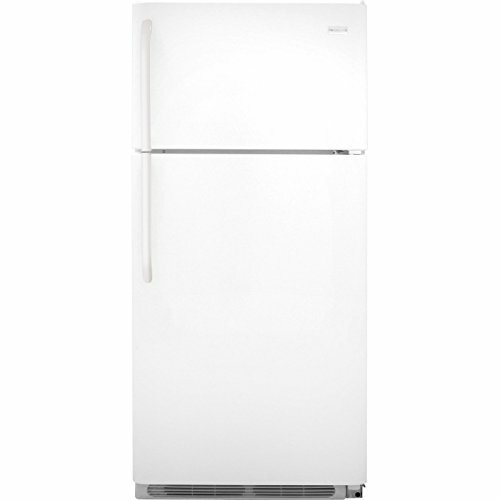 We have reviewed a couple similar models of refrigerators from Whirlpool and GE. We provide you with some quick information you can compare and then give you a bit more insight into how these other two models compare to the FFTR1814QW. The Frigidaire FFTR1814QW gets mixed reviews. Some feel this is a great refrigerator as long as you understand what you are getting. It is not fancy and will not have a bunch of features, but it will keep your food cold. In fact, many consumers loved that it gets cooled down very quickly after plugging it in. However, there were plenty of complaints about build quality; specifically, the handle seems to be an area where many consumers had issues. There seems to be a weakness that requires handle replacement quite often. The Whirlpool WRS321SDHZ is comparable to the Frigidaire model in that it is a basic unit. It does not have a lot of extra features. However, it fairs better in reviews. Consumers feel it performs well and delivers exactly what it promises in a unit that keeps food at the right temperature. The only issue seems to be an ill-fitting freezer door that requires adjustment to ensure it is closing properly. This appears to be a design flaw that is rather common. Another basic refrigerator, the GE GTE16DTHCC is praised for being roomy for a small refrigerator. Consumers enjoy the overall quality and feel this is a good value. Some consumers do feel it is too loud when it is running. This unit has a leg up on the Frigidaire model when it comes to customer satisfaction because most consumers felt this was a good choice with very few complaints. It is always important to consider the good and the bad about a product. This is especially true when it comes to a refrigerator. What we found as we looked through countless user reviews is that some people have minor complaints that may not even bother someone else, but they make a huge deal out of it. We made sure to weigh every review considering such bias. What we present below is an accurate account of the pros and cons of the FFTR1814QW. It cools down quickly for its initial use. Bins and shelves are solid and not likely to break or crack with use. It’s great as a second refrigerator for storing extra beverages or freezer items. The layout of the interior of refrigerator compartment is efficient. The handle is weak and likely to break. Not having rollers on bins can make it hard to get them in and out when full. May be too noisy for some consumers when the compressor kicks on. We chose our rating by looking at consumer reviews, manufacturer data and expert opinions. Using the information we gathered, we also took into consideration bias and other outside factors that may cloud the reviews we read. Weeding out these things, we were able to get to the heart of things and create an unbiased and accurate rating of four out of five stars for the Frigidaire FFTR1814QW. One of the main things to keep in mind about this refrigerator is that it is a basic model. It seems many reviewers forgot that. At this price point, you just won't find fancy features or anything really extraordinary about this unit. You get a basic refrigerator and freezer to keep your food cold. Some reviewers seemed to be expecting much more from this unit, which led to complaints. However, those that recognized what they were buying seemed to be genuinely happy about their purchase. Of course, there are always some issues with a product. In many cases, the issues seemed to be isolated incidents that resulted from problems during delivery, which the manufacturer has no control over. 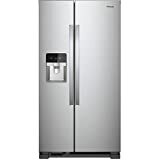 There were also a few complaints about communication issues between service personnel from the retailer and Frigidaire, which again, is an issue that goes beyond the Frigidaire FFTR1814QW and is more based on the company. The biggest issue that seemed to be repeated again and again was with the handle. This does not seem to be an isolated issue, but something that you must consider when buying the unit. The handle appears to not be very well made. It is a cheap plastic handle that will crack and break in time. Even with light use, it appears the handle does not hold up well. So, unless you are willing to keep replacing it each year, this could be the deal breaker when it comes to this refrigerator. This issue is also why we took away a star in our final rating. When it comes to doing the basic job that it should do, the Frigidaire FFTR1814QW does a good job. After all, what you really want in a refrigerator is a unit that keeps your food at the proper temperatures. This unit does that. There didn't seem to be any complaints that this refrigerator doesn't operate properly, which is a good thing. There will always be isolated incidents where a unit may be defective, which we took into consideration as we developed our rating. It appears that the only complaints about the actual operation were isolated issues. So, we feel confident that if you purchase this unit to work as a basic refrigerator, you will be satisfied and it will get the job done. The bottom line is that we would recommend the Frigidaire FFTR1814QW. It is probably going to suit your needs best if you have a very small family or if you use it as a second refrigerator. It is not meant to service a large family as it is a smaller sized unit. In addition, you should make sure it fits your expectations. There are no high-tech features or special aspects to this refrigerator. It is a basic unit that will properly cool your food and maintain it at a safe temperature. If you buy this unit knowing what it offers, you should be fairly satisfied. 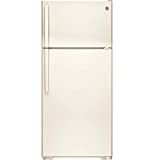 Frigidaire is one of the companies that produces best quality of refrigerators. One of its best product is FFTR1814QW, the materials used by creating this product is in great quality. Its bins and shelves are solid and not likely to break or crack with use and it cools down quickly for initial use. However, Not having rollers on bins can make it hard to get them in and out when full.